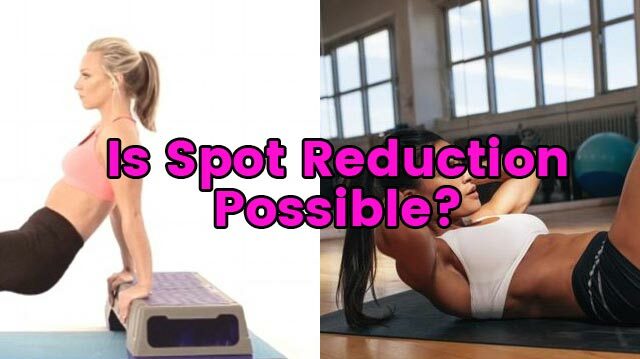 Spot Reduction - Can you burn fat from one place? Home » Workouts » Fat Burning Workouts » Spot Reduction – Can you burn fat from one place? Spot Reduction – Can you burn fat from one place? Is it really possible to burn fat from your just abs? We’ve all got our niggling imperfections. We shouldn’t have, as it’s more about how you feel and not how you look. BUT, with pressure from media and all angles in life we constantly strive to look and feel better. With these little bits of flab under your arm, or maybe a bit of belly from that calorie laden white wine (GUILTY), the first thing you’re probably going to think is how to reduce them down. But is tackling one problem fatty area really possible? The industry term for this process is ‘Spot Reduction’ and you’ll see plenty of workouts and supplements that suggest you can achieve it. Is the science there though? Can humans really target one problem area? So Spot Reduction is the term that is used when someone thinks they can remove an area of fat from a certain part of your body. Basically, if you have a heavy middle, which we all will at some point (thanksgiving dinner I’m looking at you), you can reduce this simply by targeting the area with excess abdominal exercises. The term was basically born from marketing. With supplements and gadgets appearing trying to trick people into parting their hard earned money just to burn away one area of fat. How Does Spot Reduction Work? Well, it’s SUPPOSED to…and not the SUPPOSED here…to work through activating muscles in the area to use fat reserves from that particular part of the body. To really understand it though, you sort of need to understand how fat burning as a whole works. When you exercise enough, or diet enough, your body will burn away fat as fuel. It does this by taking sending the fat to the liver, where it’s broken down and turned into energy. It is slightly more complex than that of course, but when it’s using this stored fat as energy it won’t pull it from one place, but wherever it can get it. If you do 9000 crunches, you’re not just going to be in lots of pain from 9000 crunches, but your body will have pulled fat from your legs and arms as well as your stomach. So spot reduction doesn’t work then? Well, not strictly, really, no. You can’t just work one area loads and hope to burn away fat in that particular area. But you can help build muscle underneath the area you want to tone by working out. Then on top of this adjust diet and nutrition accordingly to burn away fat and reveal a more defined and rounded muscle. By working the muscles underneath a particular area you are achieving something which sciencey types have labelled ‘spot lipolysis’. This basically means due to the increased blood flow and activity of the muscle in that area (best achieved from weight training) you may see some slight increases in fat burn. So you can do spot reduction then? Whilst science is slightly shifting in favor of it, no, you can’t really. The results you can get from spot lipolysis is going to be fairly negligible and require quite a high volume of work to go into a muscle or area before this starts happening. There’s plenty more research coming about all of this, which is exciting, but we still wouldn’t hold our breath for a conclusive method or answer anytime soon. With all that is said about spot reduction, it will never, and cannot replace a good solid exercise regimen. If you want to lose weight in a particular area, don’t do the 9000 crunches, but instead do a range of exercises with a slight focus on the problem area. Build up the strength there (don’t be afraid to hit the weights room) and then cut back on calories and clean up your diet. So while you might be depressed and turning to the wine over the lack of compelling evidence for spot burning, a good natural fat burner supplement can really amplify your bodies ability to burn fat. We’re not just talking spot burning, but an all over and all day fat burning process that could see a fitter and slimmer you in around 30 days.